Right now new TopCashBack members can enjoy a FREE pack of Luvs Diapers from TopCashBack! Purchase your Luvs Diapers from Walmart.com for $15.97 and your $18 TopCashBack rebate will post to your account within 21 days. Click “Get Cashback Now” button to open the Walmart shopping page. 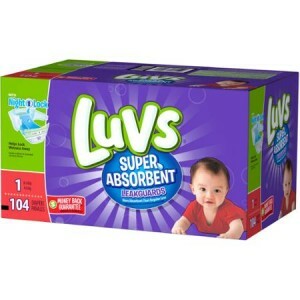 A new tab will open and should be on the Luvs Super Absorbent Disposable Diapers Jumbo Pack of Diapers, (Choose your Size), priced at $15.97. Add to cart and proceed through checkout (choose FREE in-store pick up to avoid shipping fees). Your TopCashBack rebate of $18 will turn payable and can be credited straight to your checking or PayPal account within 21 days. Be sure to share this deal with friends and family – TopCashBack doesn’t limit accounts to one per household -so now’s a great time to have your spouse, room mate or neighbor (or anyone else!) about TopCashBack. Use your Tell-A-Friend Link when you share this deal with friends and family and you’ll earn $10 for each new TopCashBack member who takes out this deal too! Top CashBack is a loyalty program that offers cash back to you for your online purchases. Why not give it a try today?! The fine print: Transactions must only contain one family pack of Luvs Super Absorbent Disposable Diapers priced at $15.97 to ensure $18 cashback is credited to TopCashback accounts. If another item is purchased or additional items are purchased at the same time, the cashback amount awarded will be 6% or less (depending on the item(s) purchased and the day of the transaction) instead of $18. The deal is open until 11:59pm PT on Monday July 11, 2016; available while the offer’s price is $15.97; if this price changes, the deal is over; subject to supplies and pick-up availability; applicable for online sales only, for purchases made directly after clicking through TopCashback.com. Only one pack of diapers is allowed per TopCashback account, and only one TopCashback account is permitted per member. Previous Post: « Shop with Alexa for $10 Off your $20 Purchase!